This book takes an in-depth look into recent developments in European social democracy. It begins by highlighting the somewhat paradoxical turn by a number of social democratic parties towards enhanced support for European integration, a move that has occurred despite the apparently ‘neoliberal’ direction of much of EU policy-output. A critical realist method is adopted, informed by both Marxist and anarchist critiques of social democratic parties, to argue that we can view this paradoxical development as resulting from the inherently unstable representation of constituents’ demands for decommodification, a process central to traditional social democratic parties. In making this argument, the book traces the transformation from ‘traditional’ to ‘new’ (or ‘third way’) social democratic parties in the UK, Sweden, France, Italy and Spain. It also outlines some of the most important developments in social democratic policy-making at the European level. 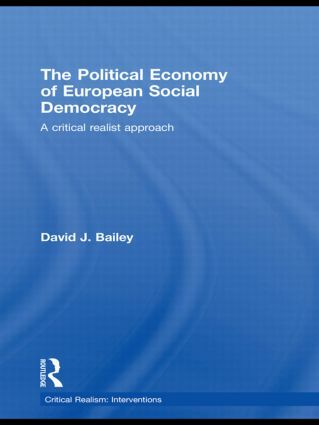 The book therefore provides an in-depth, theoretically-original, analytical narrative of the key empirical developments to affect contemporary social democratic parties in recent years. In highlighting some of the contradictions inherent to both ‘traditional’ and ‘new’ social democratic parties, the book does much to suggest some of the reasons for their continued decline over the past three decades. David Bailey completed his PhD at the London School of Economics, and currently teaches at the University of Birmingham. His research focuses on social democratic parties and European integration. He has published articles in the Journal of Common Market Studies, and Comparative European Politics.